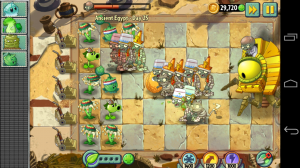 A few days ago, it was released a new update to Plants vs Zombies 2, which brings Dr. Zomboss back. We will find him on the last stage of the “Ancient Egypt” world and we shall see him, in future deliveries, also appearing among both pirates and in the “Far West”. This update, free of charge, has set the well-known Dr. Zomboss as the final challenge to pass the level. As in the rest of the game, you can defeat him without resorting to any in-app purchase, although Dr. Zomboss is a worthy opponent that will test our skills. To overtake him without any extra help we need to plan our strategy carefully and use some extra power, so make sure to have a good supply of coins before facing Dr. Zomboss! With the update also comes a new power, the Snowball Power, which replaces the “Pinch Power”, impractical to use, that didn’t help us practically in any dire situation. In this case, the “Snowball Power” is much more useful, because when we activate it, the activity of all Zombies present freezes, slowing down their movement during the seconds it is active, without requiring any action from our part, so we can use this “pacefull moment” to reorganize our defense. This update seems to be the predecessor of two other similar ones because we have to face Dr. Zomboos the end of the other two worlds before unlocking the mysterious futuristic world. This means that after you have downloaded the 200 MB that requires this update, it only gives us some minutes, because once we have beaten Dr. Zomboss in the Ancient Egypt world, we still need to wait for the next updates, when he will appear in the other worlds. 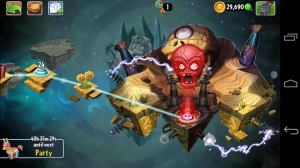 However, it is a minor complaint as it is an excellent game that has managed to have a good balance between the in-app purchases and the gameplay, to the point that you can pass all the levels without spending a single buck, and without altering the rhythm of the game. Not many games manage to get this balance.